Earn 100 percent completion and unlock all endings in The Painter of Detroit: Become Human. 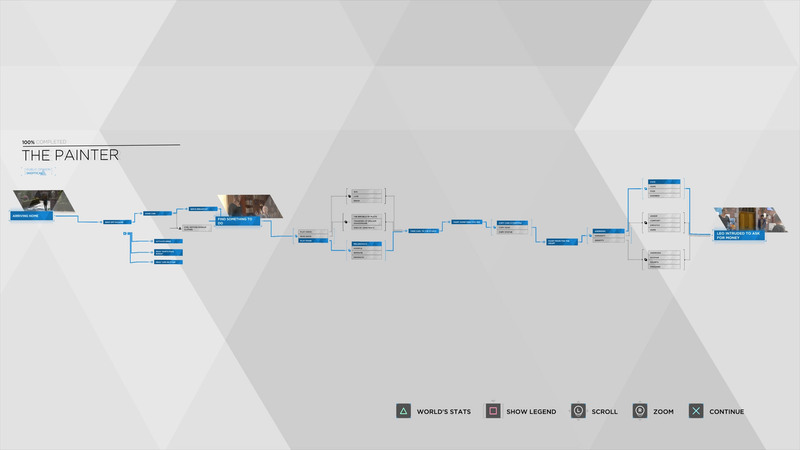 This walkthrough for The Painter in Detroit: Become Human will assist players with earning 100 percent completion in their flowchart and unlocking the only possible ending. A total of three runs through this chapter are required to get 100 percent completion. The 100% complete flowchart for The Painter. Getting to 100% completion in the chapter known as The Painter will be another fairly easy task. Players need only make a few choices of leisure activites, with all of them ultimately ending in the chapter's sole finale. This is the only possible ending to this chapter. No matter what Markus chooses to do this cinematic plays out the same way each time. None of the choices made during this chapter affect any others going forward, so multiple runs should only be done to earn the 100 percent completion rating outlined above, not to try and alter how the game plays out. When The Painter is all done, move on to Partners. For those that wish to browse through the 100 percent completion requirements for each chapter, the Detroit: Become Human 100 percent walkthrough will have a list that includes all possible endings for each one and how it will impact future decisions.